After I covered the basic signs with C, I started getting a little bored with the signs and wanted to expand our vocabulary in to a useful area – specifically, I wanted to start “teaching” her some of the more advanced topics to see how she’d do. We started with colors… I used learned the signs for each of the colors, as well as the sign for “color” itself, and started using them on a daily basis. While going about our day, I’d point out, “This is the color green”, or “This is red”. It took a while before she started to grasp the concept that colors are descriptions, rather than names of things. This became apparent when she stopped signing “dog” for her brown dog and just started signing “brown” instead. I’m not sure if she thought it was the dog’s name, or another word for the dog, but it took several months before she signed “brown dog” together. When she did, though, WOW! I was impressed! Still, I thought, perhaps she’s just emulating me, as she sees me signing/saying “brown dog” and copies what I do. I quickly learned that wasn’t the case. We were out at the store one day looking at rainboots for C. I held up two pairs – one green, one blue. I looked at C and asked, “Do you want green or blue?”, careful not to hold up or look at either as I said the colors. C immediately lunged for the green ones, shouting “GREEEE!! !” and making the sign for “green”. I guess she knew what green was!! Ok, so now colors were added in to our daily signing/speaking vocab, so I wanted to go a step further. C loves to color, so I started adding shapes to her pages as she colored and would tell her what they were. I started with star, circle, heart, square and triangle. I would draw a shape, name it, then move on to another shape. Sometimes just focusing on a few shapes on a page, sometimes drawing them all. I started this with C in late December, continuing to name things as I went with little to no sign of recognition from C. Occasionally, I would ask her to point to a shape, and sometimes she would get it, other times she wouldn’t. Then one night at the end of February, while sitting at dinner with my parents, I did the normal drill. I drew the shapes on the placemat in front of her and asked her what the shapes were. Circle? she pointed. Square? she pointed. So far these two shapes were in order – left to right. I decided to make things a bit trickier and asked her about a shape at the end. Heart? she points to the last shape. Triangle? She points. Star? She points (and signs “star” – one of her favorite words to sign). Way to go C! Recently, I taught C the sign/word “happy” – she LOVES saying the word happy now. She will sign it when prompted, but mostly she just loves saying “AAAPPPYYY!!”. Then I showed her how to draw a happy face, which she also calls “AAAPPPYY!” She’ll bring a crayon and paper over to me and ask for “APPY”. I “help” her draw the happy face by guiding her hand, and have started narrating as I go. 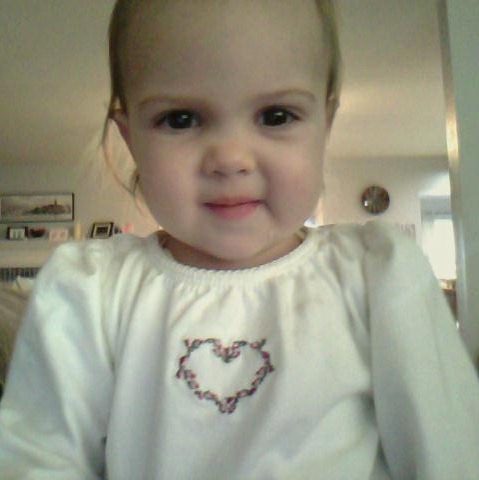 “Circle, dot, dot, smile!” C now says “dot" preemptively after we finish the circle now – she knows what comes next! We’ve moved on to making happy triangles, hearts and squares, but the original happy circles are by far her favorite. Maybe it’s just C, but it seems like it takes approximately 2 months of continual reinforcement to teach something. The main thing (for me) has been sticking to it. For example, we started introducing C to her ABC’s early on (we’ve been singing her the alphabet song since birth! It was one of the few kid songs we had readily available in our repertoire). But, again, we never really saw any recognition with letters until very recently. It wasn’t until I started going through the letters and really pointing them out to her that she started saying them back. And I had to do it consistently. We have fridge letters that I’ve been using to work with her, and while she enjoyed playing with them and hearing the ABC song play (it’s a musical system), it didn’t seem to be sticking with her. Then I found the trick – we have foam alphabet letters on the ground in our playroom, and I started going around the room pointing to the letters as I sang the alphabet song. I think this gave her a tangible object to associate with the song and really helped it “click”, because she ate it right up! She would grab my hand and point my finger on each letter, looking up at me to tell her what we were pointing at. I think the fact that these foam letters (though moveable) were in the same place every day helped the information solidify for her. Now she knows several letters – B, C, E, H, M, O & Q. Random, I know, but those are the ones that have stuck with her. We were driving past a “Borders Book & Music” store and I was sitting in the backseat with C and she starts saying “Beee! !” “Beee! !” At first I wasn’t sure what she was trying to say, but then she pointed at the large red sign and said “red!” (which really sounds more like “rehh”, but I knew what she meant). Once I acknowledged that, “Oh, there is a red “B” up there!”, she went on to talk about the “O” and the “M”. The positive reinforcement is everything with her. It works wonders! It really is amazing to actually be able to watch their minds working. I enjoy your stories about Claire when I check in on you. I remember when Kirstin was going around labeling things and she first noticed a plane going over. She looked up, pointed, and said, “Bird”. I said no and she quickly said, “Car”. Before I could label the plane she called it a “car-bird” and stubbornly persisted with her label for a couple months. Teaching young people signing must be very liberating for them. Continue having fun! Joyce – I LOVE your story! That is so adorable! It’s amazing how kid’s minds work.